When different elements combine through chemical reactions, they form compounds. When compounds contain carbon, they’re called organic compounds. The four families of organic compounds with important biological functions—carbohydrates, lipids, proteins, and nucleic acids—are covered here. These molecules consist of carbon, hydrogen, and oxygen in a ratio of roughly 1:2:1. If a test question involves identifying a compound as a carbohydrate, count the atoms and see if they fit that ratio. Monosaccharides, or simple sugars, are the building blocks, or monomers, of larger carbohydrate molecules and are a source of stored energy (refer to the figure). 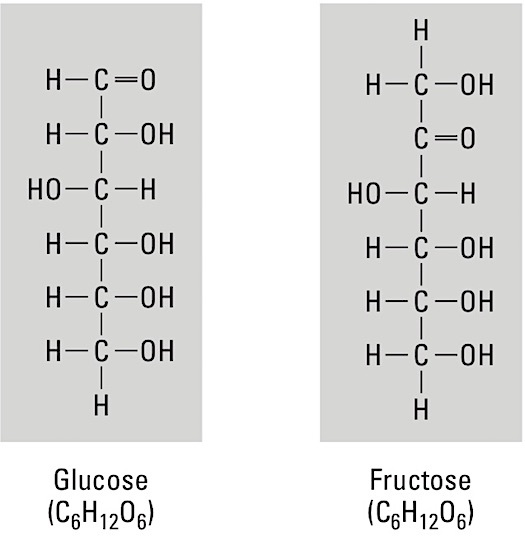 Key monomers include glucose, fructose, and galactose. These three have the same numbers of carbon (6), hydrogen (12), and oxygen (6) atoms in each molecule—formally written as C6H12O6—but the bonding arrangements are different. Molecules with this kind of relationship are called isomers. Two important five-carbon monosaccharides (pentoses) are ribose, a component of ribonucleic acids (RNA), and deoxyribose, a component of deoxyribonucleic acids (DNA). Disaccharides are sugars formed by the bonding of two monosaccharides, including sucrose (table sugar), lactose, and maltose. Oligosaccharides (from the Greek oligo, a few, and sacchar, sugar) contain three to nine simple sugars that serve many functions. They are found on plasma membranes of cells where they function in cell-to-cell recognition. Polysaccharides are polymers, formed when many monomers bond into long, chainlike molecules. Glycogen is the primary polymer in the body; it breaks down into individual monomers of glucose, which cells use to generate usable energy. The most commonly known lipids are fats. These molecules consist of a 3-carbon glycerol linked to fatty acid chains. Insoluble in water because they contain an abundance of nonpolar bonds, lipid molecules have six times more stored energy than carbohydrate molecules. Upon hydrolysis, however, most fats form glycerol and fatty acids. A fatty acid is a long, straight chain of carbon atoms with hydrogen atoms attached, as shown here. If the carbon chain has its full number of hydrogen atoms, the fatty acid is saturated (examples include butter and lard). If the carbon chain has less than its full number of hydrogen atoms due to double bonds, the fatty acid is unsaturated (examples include margarine and vegetable oils). Phospholipids, as the name suggests, contain phosphorus and often nitrogen in place of one fatty acid chain. These are aligned side-by-side to form the cell membrane. Other lipids include cholesterol, vitamins A and D, and the steroid hormones. Among the largest molecules, proteins can reach molecular weights of some 40 million atomic units. Proteins always contain hydrogen, oxygen, nitrogen, and carbon, and sometimes contain phosphorus and sulfur. Examples of proteins in the body include antibodies, hemoglobin (the red pigment in red blood cells), and enzymes (catalysts that accelerate reactions in the body). The human body builds protein molecules using 20 different kinds of monomers called amino acids (refer to the figure). An amino acid is a carbon atom attached to a hydrogen atom, an amino group (-NH2), a carboxyl group (-COOH), and a unique side chain called the R group. 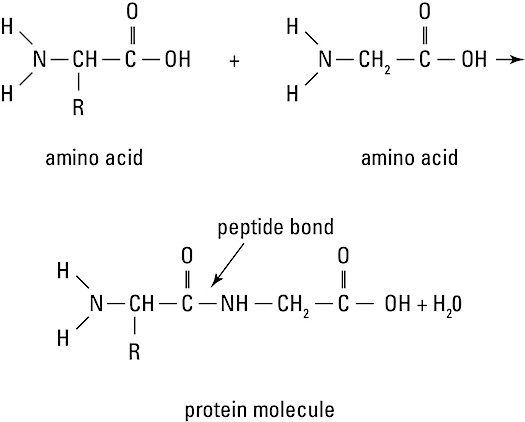 Amino acids link together by peptide bonds to form long molecules called polypeptides, which then assemble into proteins. These bonds form when the carboxyl group of one molecule reacts with the amino group of another molecule, releasing a molecule of water (dehydration synthesis). A polypeptide, however, is not a functioning protein. It must then be folded, twisted, and often linked with other polypeptides to create a three-dimensional structure which allows it to carry out its function. These long molecules, found primarily in the cell’s nucleus, act as the body’s genetic blueprint. They’re comprised of smaller building blocks called nucleotides. Each nucleotide, in turn, is composed of a five-carbon sugar (deoxyribose or ribose), a phosphate group, and a nitrogenous base. The sugar and phosphate groups link to form the backbone of the molecule. The base is attached to the sugar and aligns with its partner on the other strand, as shown in the figure. 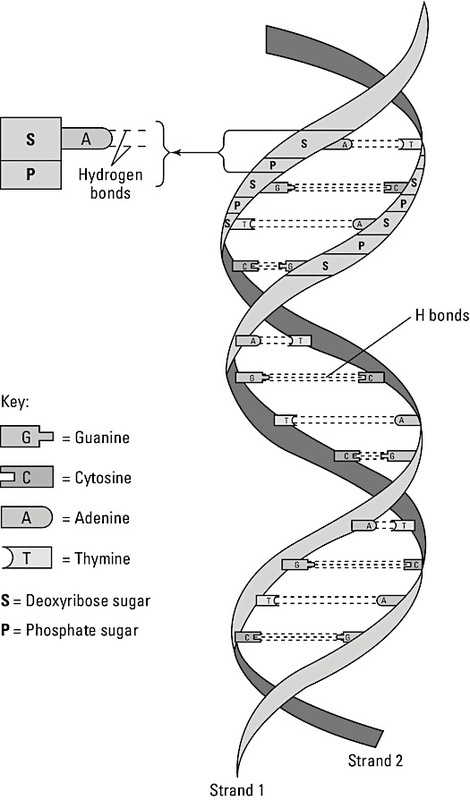 The nitrogenous bases in DNA are adenine, thymine, cytosine, and guanine; they always pair off A-T and C-G forming hydrogen bonds between the bases, creating the rungs of the DNA ladder. In RNA, which occurs in a single strand, thymine is replaced by uracil, so the nucleotides pair off A-U and C-G during transcription.